We’re big fans of LED torches at Camping Things. We think they produce a clearer, crisper light, which is great for seeing at night, in wooded areas and caves. They also last longer than incandescent bulbs, and don’t dim as much over time. You’ll find a range of style and prices to choose from here, but be aware, that a torch is an investment. You won’t be replacing it anytime soon. As always, we’ve tried to strike a balance between high quality kit and great value for money, so you’re assured an outstanding handheld torch, whichever one of our picks you choose. The Zweibrüder is virtually a handheld searchlight. 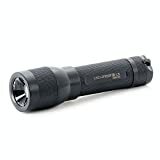 It’s one of the brightest torches on our list at 1600 lumens, and since it’s rechargeable, you’ll enjoy lighting up the night again and again. Features a 600m light range, with a 7-point LED head, 8 light functions and 3 light programmes. Comes with charging station, carry strap and tripod mount for stationary lighting. There are no batteries in the Ledlenser Handheld Torch, it’s fully rechargeable. The pack contains the torch, a carry case and strap, charging station and a tripod mount. We like the tripod mount, and found it to be a nice touch. Especially useful if you’re setting the torch up as a semi-permanent light source. The Ledlenser Handheld Torch is made from aeroplane-grade aluminium, which means it’s about as strong and light as a torch can be. Super hard and durable, it does weigh a couple of kilos, but if you’re in the market for a professional-level torch, the Zweibrüder is a winner. With 8 light modes and 3 light programmes, the Ledlenser Handheld Torch is highly customisable, allowing you to choose the most appropriate setting for whatever you’re doing. With a 7-point LED unit at the front, the light is evenly dispersed and powerful. Experienced hikers, cavers, and those camping in extremely dark wooded areas. There are no batteries in the Ledlenser Handheld Torch, it’s fully rechargeable.